1 September 1914: Entered the Army Reserve as a War Volunteer in the Feld-Artillerie-Regiment von Puecker (1. Schlesisches) Nr.6. 22 October 1914-6 February 1915: Sick/hospitalized in Breslau. 16 March 1915: Transferred to Field Artillery Regiment 104 and in the field. 1 January 1917-28 February 1917: Detached to the Training Course for Officer Aspirants at the Field Artillery Firing School at Jüterbog. 12 September 1918: While retaining his war position with Field Artillery Regiment 104, transferred to the Feld-Artillerie-Regiment von Podbielski (1. Niederschlesiches) Nr.5 as an active Leutnant. 1 February 1919: Transferred to Field Artillery Regiment 5 and then to Light Reichswehr Artillery Regiment 29 of Reichswehr-Brigade 29. 6 August 1919: Observation Officer in the II. Battalion of Reichswehr Artillery Regiment 29 of Reichswehr-Brigade 29. 25 November 1919: Adjutant of the II. Battalion of Reichswehr Artillery Regiment 29 of Reichswehr-Brigade 29. 1 March 1920: Adjutant of the IV. Battalion of Reichswehr Artillery Regiment 6 of Reichswehr-Brigade 6. 15 May 1920: Second Ordonnanz-Offizier on the staff of Reichswehr Artillery Regiment 6 of Reichswehr-Brigade 6. 4 October 1920-22 December 1920: Detached to Artillery Firing School at Jüterbog. 1 January 1921: Transferred to the 3rd (Prussian) Artillery Regiment upon the formation of the new Reichsheer from the Übergangsheer or Transitional Army. 1 October 1921-4 July 1922: Detached to the Cavalry School at Hannover. 1 March 1922: Transferred to the staff of the III. Battalion of the 3rd (Prussian) Artillery Regiment. 9 April 1923-16 May 1923: Detached to Course B 15 at Jüterbog. 1 October 1923: Adjutant of the V. Battalion of the 3rd (Prussian) Artillery Regiment. 1 August 1927: Transferred to the 16th Battery of the 3rd (Prussian) Artillery Regiment. 3 October 1927-15 February 1928: Detached to the Weapons School Course at the Artillery School. 3 June 1929-30 September 1929: Detached to the 15th Infantry Regiment. 1 October 1929: Detached for Leader Assistant training with the staff of the 6th Division. 1 October 1931: Transferred to the 4th Artillery Regiment and detached to the Commandant of Berlin. 1 August 1932: Detached to the staff of the 1st Division. 1 October 1932: Transferred to the staff of the 1st Division in the Uniform of a Leadership Staff Officer. 1 July 1934: Transferred to the 2nd (Prussian) Artillery Regiment. 15 September 1935: Transferred to the staff of the Commandant of Berlin. 1 July 1936-30 September 1936: Detached to the General Staff of Group Command 2. 1 October 1936: Operations Officer (Ia) in the General Staff of the 2nd Division. 18 September 1942: Detached to the General Quartermaster in the General Staff of the Army. 27 November 1942: Delegated with the leadership of Grenadier Regiment 386 of the 218th Infantry Division on the Eastern Front. 5 March 1943: Delegated with the leadership of the 305th Infantry Division in France. 1 June 1943: Commander of the 305th Infantry Division in France (division transferred to Italy from August 1943). 24 November 1944: Delegated with the leadership of the LXXVI Panzer Corps in Italy. 7 December 1944: Army High Command Leader Reserve. 5 January 1945-15 January 1945: Detached to the Course for Commanding Generals in Hirschberg/Silesia. 15 January 1945-24 January 1945: Delegated with the leadership of the LXIV Army Corps in Alsace, France. 20 April 1945-2 May 1945: Commanding General of the LI Mountain Army Corps in Italy. 2 May 1945-7 February 1948: Prisoner of war. 1965: Published the divisional history Eine deutsche Division im Rußlandfeldzug – 305. Infanterie-Division (A German Division in the Russian Campaign – 305th Infantry Division). 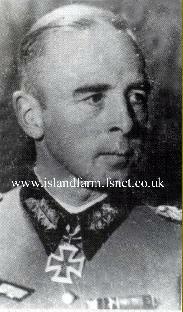 Knight’s Cross of the Iron Cross: 11 June 1944, Generalleutnant, Commander of the 305th Infantry Division. German Cross in Silver: 6 July 1942, Oberst, Senior Quartermaster in the General Staff of the 11th Army. Order of the Star of Romania, Commander with Swords on the Ribbon of Military Virtue: 19 September 1941 (Royal Decree No. 2628).